All the pet parents we meet have one thing in common: they love their animals dearly. One parent in particular, Leona Fontaine, is a self-proclaimed lover of all cats. It all started when someone dropped off a cat at her front door. She took the cat in and fell in love. Since that moment 15 years ago, she’s been rescuing cats. About six years ago, Leona found two domestic shorthair kittens in her yard. They appeared to be just 2-3 months old. When no one claimed them, she had them fixed and adopted them into her home. Their names were Jeremy and Dylan. Dylan came into Leona’s life around the time Misty lost her battle to cancer in 2010. Though she loves all her cats, Leona says Dylan really touched her heart. One Saturday in July 2016, Leona was quick to notice that Dylan was limping down the stairs slowly. When she touched his right leg, she could tell he was in pain. She took him to the emergency room thinking he may have fractured his leg while running around. The hospital called Leona back to say that X-rays revealed a possible mass. This was later confirmed by a veterinary oncologist. Dylan was diagnosed with osteosarcoma (bone cancer) on his pelvis, and the cancer was very advanced. Chemotherapy is not an effective option for bone cancer. Surgery would have involved amputation, which was too much of a risk for Leona to take. A third option, and the one recommended by Dylan’s oncologist, was palliative care, which is intended to ease discomfort without the hope of long-term survival. However, a new radiation therapy called stereotactic radiosurgery (SRS) was also discussed as an option. SRS is far more advanced than conventional radiation therapy in its ability to target tumors with sub-millimeter precision, offering the potential to increase both length of life and quality of life with little to no side effects. While still relatively new in the field of veterinary oncology, SRS is quickly emerging as an ideal treatment option for many pets with cancer. For Leona, focusing on palliative care was simply not enough. Three weeks passed between Dylan’s diagnosis and his first SRS treatment. During that time, he had many life-threatening emergencies. The pain from Dylan’s cancer was intensifying, and he was on high doses of medication to help him urinate and defecate. He was hospitalized for stabilization multiple times. Even through this difficult month, Leona remembers how happy Dylan was to see her when she visited him at the hospital. Once Dylan was stabilized and off a catheter, he was taken to PetCure Oncology at VRIC (Clifton, New Jersey) to receive three sessions of SRS from August 15–17. Dylan had no negative side effects from the radiation outside of a small patch of hair that turned white, which Leona said looked cute to her. (Aug 20) Dylan receives a good brushing a few days after treatment. Listen to that purring! Dylan has had two X-rays since treatment. The first revealed that the bones that had been damaged by the cancer cells surrounding the tumor were healing. His second X-ray, a few weeks later, showed that his bones had completely healed. And Dylan is back to jumping and running with no discomfort at all! In addition to the time when Misty first opened up, Leona shared that saving Dylan was another one of those “best moments” in her life she’ll always remember. We wish Leona and Dylan (and all his cat brothers and sisters) many more “best moments” to come! 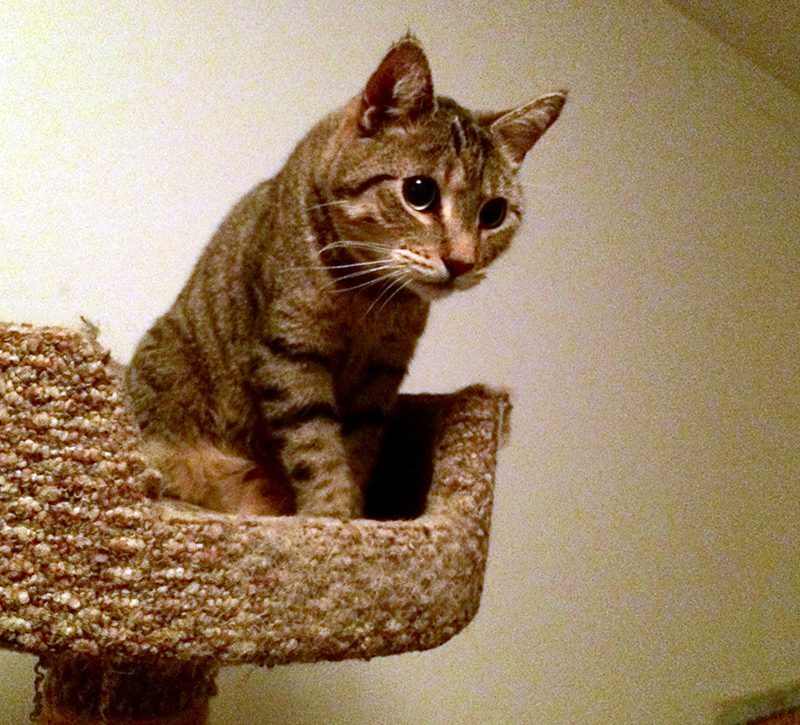 (Nov 15) Dylan jumps on the highest tier of the cat tree with no pain meds one month after treatment. 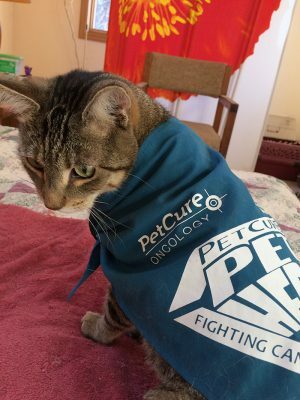 If you have a pet that has been diagnosed with cancer, contact a PetCure location near you. We are ready to help answer your questions and guide you through this difficult and emotional cancer journey. You can also reach us at Hope@PetCureOncology.com or 773.850.3400. Did you love reading Dylan’s story? Meet our other Pet Heroes!